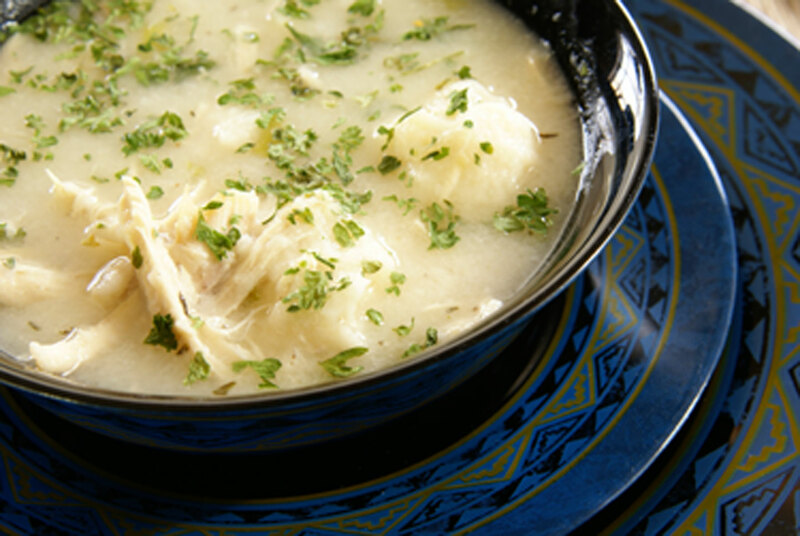 Chicken and dumplings is ideal comfort food, especially when the temperature drops. While it would be easier to use boneless, skinless chicken breasts and/or thighs in this recipe, you'd be sacrificing a lot of flavor and richness for "quick 'n easy". This recipe is from an article featuring company chicken recipes. Place the chicken in a Dutch oven or other large pot, and add the water, broth, carrot, onion, celery, salt and pepper. Bring to a boil, cover and lower heat. Simmer for 60 to 70 minutes, or until tender and chicken is done. Remove chicken and allow it to cool enough to handle. Remove the carrot, onion and celery pieces from the broth and discard. Reserve the broth. Return the boned chicken to the mixture and simmer until heated through. Add the freshly ground black pepper and remove from heat. Dumpling dough is very similar to biscuit dough and, like biscuit dough, the less it is handled, the lighter and more tender the result. Read all about dumplings in John Raven's article about dumplings from scratch, The Universal Dumpling.